One often comes across the phrase “It’s in my genes” in our day-to-day life. Less than a century after their discovery, the words 'DNA' and 'genes' are commonly used by all and are also a common topic of speculation in the academic as well as the non-academic world. Some scientists believe that "the living body/cell is just a mere vehicle produced and used by the genome to carry on information ahead in time generation after generation”. Readers with a biology background are aware of the “Central Dogma of Molecular Biology”; for others let me just brief it. It proposes that DNA in genes produces RNA which in turn produces proteins that give a phenotype to an individual. It also states that the transfer of information is unidirectional (DNA to cell ) and not the other way round. 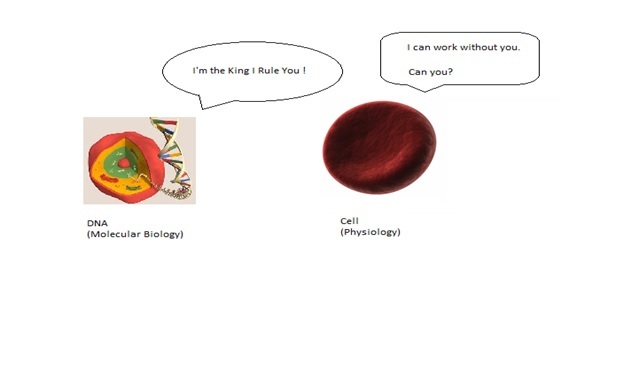 This is considered to be the basis of molecular biology. I would like to discuss a few implications of crediting DNA /genes with life in a cell. Is Inheritance a property of just the DNA? It is generally considered that DNA is the ultimate factor of inheritance. Keeping this in mind, now let us consider cross species cloning (i.e. taking an egg cell and the DNA from two different species). The result of most experiments of cross species cloning are non-viable cells which freeze at early developmental stages and a very few cases of development of an infertile hybrid. The hybrid produced shows features distinguished from the species from which the DNA was isolated. For example when a hybrid between a gold fish (egg cell) and a carp (nucleus) was produced it showed morphological similarities to the gold fish such as round shape and vertebrae number. Why did the carp genome fail to generate the features similar to the carp from which the nucleus was isolated, when incorporated into a fully functional cell? A possible answer could be that the complete cell along with the nucleus should be regarded as unit of inheritance and not just the genome. Cross species cloning results suggest that inheritance of traits/characteristics is not the sole property of DNA but a cumulative property of the entire cell. There several 'epigenetic' factors of inheritance which will be discussed in detail in coming articles. For the interested reader, I have attached the link to the cross species experiment at the end of this article. Is Evolution a result of just random mutations in the genome? Theory of Evolution proposed by Darwin states that evolution is the result of gradual process initiated by spontaneous mutation and guided by natural selection. After discovery of DNA, the central dogma was then used to explain evolution with a gene-centric view; Spontaneous mutations were considered to occur randomly in the genome which would alter the gene resulting in a mutant phenotype and were then subjected to natural selection. Recent studies seem to contradict the concept of random mutation. It was observed that P-element (transposon, the cut and paste functions of your DNA that allow DNA to move along the geneome) in drosophila was frequently found in genes with related function and not just in some random fashion. While, the phenomenon of targeted insertion is not yet completely understood it is thought to be related with the structural organization of the genome which is in-turn regulated by protein machinery (histone proteins) of the cell. This phenomenon hints towards mutation guided by physiology than just a random event. Scientists are working on more studies to validate this hypothesis. The first half of the 20th century was dominated by molecular biology. Such was the importance given to this field that the cell and the organism as a whole lost their importance. With observations such as described above, cell physiology is making a come back in our understanding of the inheritance. In the process it also pose challenging questions in the field of evolutionary biology and develop our understanding of how we have reached where we are now. This article is an idea inspired by the book “The Music of Life” by Denis Nobel. Article related to cross-species hybrid experiment.